PYEONGCHANG, South Korea, Feb. 9 (Yonhap) -- The 2018 Olympic Winter Games kicked off in PyeongChang on Friday with an opening ceremony themed around peace and future. The two-hour ceremomy was highlighted by a rare joint march by athletes from the two Koreas. The opening ceremony of the first Winter Olympics in South Korea took place at the 35,000-seat PyeongChang Olympic Stadium, celebrating traditional and modern Korean characteristics of harmony and convergence, and underscoring the Korean people's hope for peace. Held under the slogan, "Passion, Connected," PyeongChang 2018, which will run through Feb. 25, will be the largest Winter Olympics ever, with 2,920 athletes competing for 92 nations. 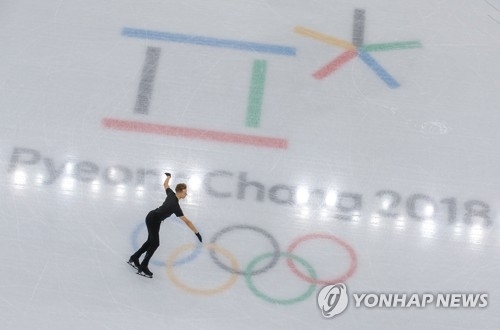 There are a record 102 gold medals at 12 venues in PyeongChang and its neighboring cities of Gangneung and Jeongseon. The ceremony, put together by executive creative director Song Seung-whan, starred five child actors, all residents of Gangwon Province, where PyeongChang is located. The number five derived from the five Olympic Rings, and the colors of the children's costumes symbolized five elements -- fire, water, wood, metal and earth. It followed the children as they embarked on a time travel on a quest for peace. The performances were put on hold momentarily as Taegeukgi, the South Korean national flag, was carried into the stadium by eight homegrown athletes, joined by several members of traditional guard of honor, a royal marching band and a children's choir. The Parade of Athletes ensued, with athletes from 92 nations walking into the main stadium. As per tradition, the order of the parade was determined in the order of the host nation's alphabet -- in "hangeul" here on Friday. Greece, the birthplace of the modern Olympic Games, was the first nation to enter. Then South Korea was the last to appear, joined by North Korea in a historic parade. This was the fourth joint Korean march at an Olympic Games, but the first on Korean soil. North Korea only offered to send athletes here in early January, and after a whirlwind of dialogue, the two Koreas agreed to terms of their joint march on Jan. 17. The International Olympic Committee (IOC) approved this agreement three days later. South Korean bobsleigh pilot, Won Yun-jong, and North Korean women's hockey player, Hwang Chung-gum, carried the Korean Unification Flag, which shows an image of the Korean Peninsula colored in blue against a white background. It has long been the symbol of a unified Korea, and athletes and officials from the two countries waved the flag in unison as they joined fellow Olympians in the stadium. South Korea has 144 athletes, its most ever for an Winter Olympics, and North Korea has sent 22 athletes, also its all-time Winter Games record. South Korea aims to win at least eight gold medals, to set its Winter Olympics record, and finish in the top four for the first time. Segments highlighting South Korea's rise to prominence from its tumultuous history and celebrating the country's prowess in information and communication technology (ICT) followed. Then Lee Hee-beom, president of PyeongChang's organizing committee, and Thomas Bach, president of the IOC, each took the stage to give speeches. At last, South Korean President Moon Jae-in officially declared the PyeongChang Winter Olympics open. At the end of their time travel, the five children held up candles and released doves in hope for peace. 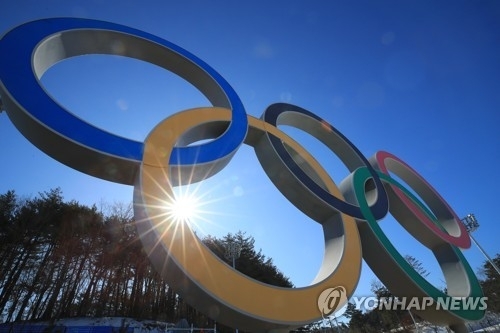 Then eight Korean athletes from winter sports brought in the Olympic Flag, featuring five Olympic Rings, as the Olympic Anthem was performed in the background. PyeongChang at least unveiled its moon-shaped White Porcelain Cauldron. Designed by South Korean designer Kim Yeong-se, the Olympic Cauldron for PyeongChang 2018 was inspired by white porcelain jar from the Joseon Dynasty. It takes after the round shape of the full moon. The design of the cauldron was also a nod to the traditional agricultural society in Korea, where the moon was a symbol of abundance and prosperity. It was also built as a reminder that the true Olympic spirit isn't about competition and victory, but about peace and harmony. And the presence of the two Koreas together in the same uniform behind one flag aptly encapsulated the spirit of the night.